Congratulations! Perhaps you’re thinking to yourself: ‘Kytary.co.uk has no reason to congratulate me’. But we think there’s a good reason. After all, you’ve decided to buy a guitar and become a musician! And for that you deserve a good pat on the back! We will be delighted to assist you with the choice of a guitar for yourself, a loved one or a child. Call 020 8089 1481 (Mon-Fri, 9 a.m. - 5 p.m.) and our experts will be happy to answer any questions you might have, and you can also send us your queries by email to . But first we need to clarify one important thing: do you want to play on a traditional acoustic guitar or crank up the volume and really let loose on an electric guitar? The choice is naturally yours, as it depends on your taste in music. You’re the only one who can answer that question. Guitars that don’t connect to anything else and require only your fingers to play are divided into acoustic and classical. Classical guitars, sometimes also referred to as Spanish guitars, are used to play classical music and flamenco (which explains the ‘Spanish’ nickname) and are ideal especially for children. The nylons strings used on these instruments simplify playing and are easier to hold down on the fretboard (they don’t cut into fingertips like metal strings). Another great advantage of classical guitars for children is the fact that they are made in a range of sizes corresponding to the age and height of the particular child. Classical guitars are also characterised by a standard body shape, a flat and wide fretboard and the aforementioned nylon strings. The strings are played with the fingers, not a pick. Click here to learn how to choose a classical guitar. Acoustic guitars, sometimes also called ‘western guitars’, are musical instruments used in rock music, pop, country, blues, folk and other similar styles Acoustic guitars have metal strings and are mostly played with a pick. Various types are made (dreadnought or jumbo), and their fretboard is curved and narrower than on classical guitars. There are also electro-acoustic models equipped with a pickup allowing them to be plugged into an amp and hence played at louder volumes at concerts and performances. Click here to learn how to choose an acoustic guitar. As you surely already know what an electric guitar looks like, we’ll explain only a few rules In order to play an electric guitar, you need to plug it into something. Of course you can play ‘unplugged’, but acoustic guitars are better for that purpose. To hear the full sound of your electric guitar, you have to connect it by cable to an amp. Amps can either be a guitar combo, which can be smaller in size and as such are ideal for playing at home, or set composed of a >guitar amp and a cab. Click here to learn how to choose an electric guitar, and here to find out what to keep in mind when selecting a guitar combo. Various effects that shape the resulting sound can be connected between your electric guitar and the amp. One of the most popular effects is distortion, which creates the quintessential sound of rock and metal music. Regardless of what type of guitar you choose, accessories that can be used on all guitars will certainly come in handy. 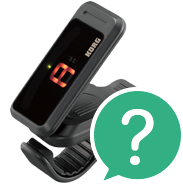 One of the most import accessories is a clip tuner, since no one wants to play out of tune. A case, stand, picks and a backup set of strings are also essential accessories.